While I thoroughly documented Finn's birthday party, I still wanted to say a few things about how our Huckleberry Finn spent his entire birthday. Most notably was his first visit from the balloon man! This was one of my favorite traditions growing up; one that still brings me much joy as I continue it for my kids. Since we cosleep, I was laying next to Finn when he first opened his yes. 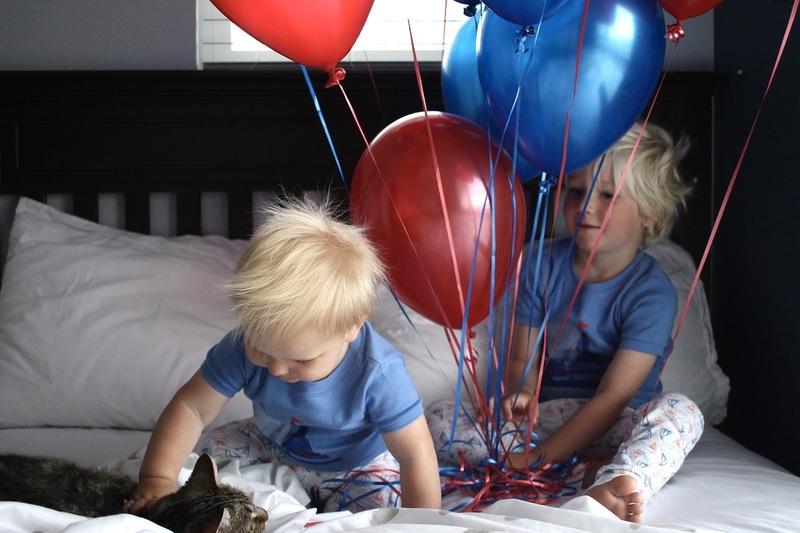 Slowly & sleepily at first, but then I saw the moment when he noticed the balloons. Twenty of them all over his room! He sat right now and muttered out "balloons!" And quite clearly! This is the stage where the first word they say each morning brings some mystery & delight. So balloons it was. 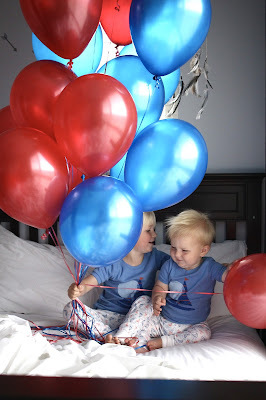 He was thrilled, balloons being one of his most favorite things and all. Big brother ran in the room moments later, and the birthday fun commenced. We sang the first round of many Happy Birthdays and covered the boy in kisses! Finn & I were able to take the morning slow, since Conor had the day off and took Liam to preschool. A lazy morning full of birthday snuggles is exactly what both Finn & I wanted. He was in a real bad stretch of teething, so all the extra sleep & nursing was needed. Then we managed to get both boys napping, while we finally party prepped. Friends & neighbors helped us throw things together, which took away a lot of my stress. I want to do it all, but really I can't. I have these grand ideas in my head of how I want things to go, but sometimes a severely teething baby needs you. But his party was perfect; exactly what I wanted. And that night, I slept next to my newly one year old. With him being my second, I know how quickly time passes. I try to soak it up and enjoy it all just a bit more. Because... I miss sleeping with my toddler; I miss hearing the first words out of his mouth each morning. So this time that we're in right now with Finn, it's a sweet sweet time! Awww that is the cutest!!! Love this tradition and that you got to experience Finns first glimpse and excitement. So special. What a wonderful day for him. Love the morning balloons and Finn-led zoo trip! The balloons sure make for an adorable photo op, such a fun tradition!! :) What a wonderful birthday day. I love this tradition. Finn must've been in awe waking up to all those balloons! Such a fun tradition! And love the trip to the zoo--wish we had one closer! And their matching jammies are so cute!! Such a fun tradition! And yay for a day of Finn - zoo exploring and all. 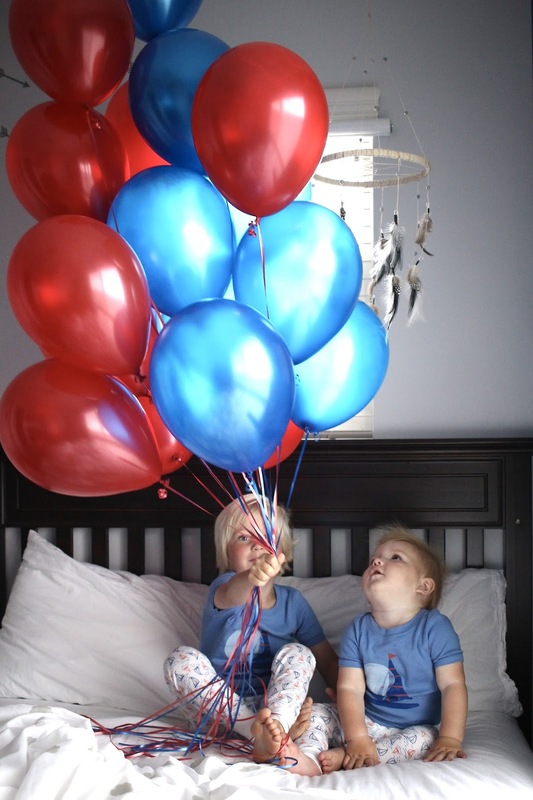 Balloons are magical! How sweet is that bedhead?! It sounds like you live in an awesome neighborhood! I wish our neighbors were so cool but most notably, our age lol. What a perfectly magical day for the one-year old! I absolutely love the balloon man idea! What a perfect start to the day. And, the zoo looks like so much fun. It is really sweet how you tried to let Finn lead the way. Glad it all worked out so well. What a wonderful way to wake up on your birthday! We've been putting balloons in Mason's room for the past couple years, I can't wait to do it again this year. He LOVES it! I love the balloon tradition! 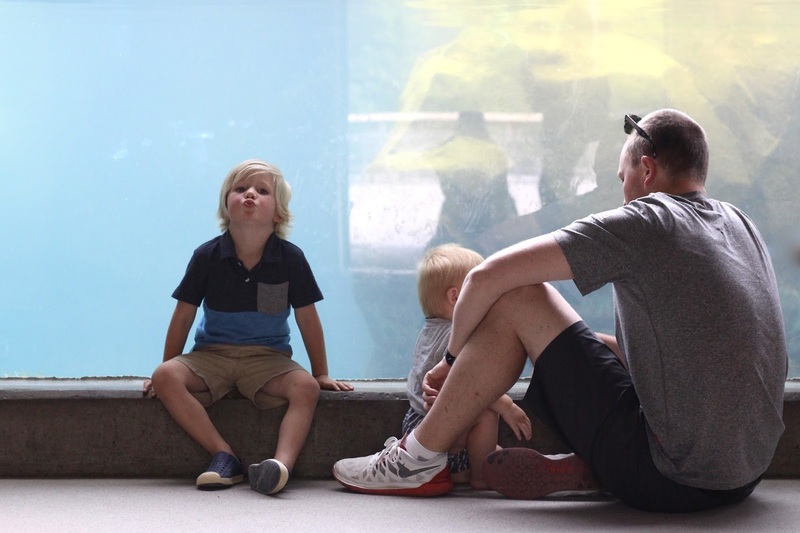 And a trip to the zoo is a perfect way to spend his birthday! And I love that you let Finn lead the way! 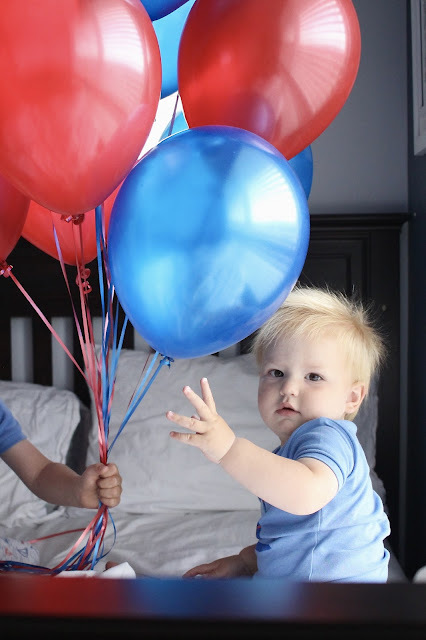 The best way to wake up on your birthday is with balloons! Loving that tradition and may steal it myself, ha! So glad Finn had such a great birthday! Absolutely precious! I just love this! Happy first birthday to your baby! Looks like so much fun! The balloon tradition is such a sweet one. I love the balloon idea. That seems like a fun tradition. And the zoo? What an amazing day! We like to jam-pack our days as well.